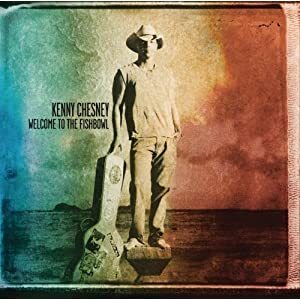 Kenny Chesney’s fifteenth studio album (and 11th number one), Welcome to the Fishbowl, finds him continuing to explore his more mature side which was hinted at on 2010’s Hemingway’s Whiskey. Fishbowl displays a serious yearning to stretch and dig a little deeper into life’s foibles, as if Chesney is trying to figure them out himself, but in a good way. The album’s name is taken from the bouncy title track, which finds Chesney pondering the consequences of celebrity for himself and for those who obtain notoriety through social media (“You don’t have to be famous now to be a star/Just get caught on video and there you are”). While Chesney has always pushed the limits of contemporary country, he seems to be slowly gravitating away from the good time drinking fare (a couple of those can be found here too) and choosing to tackle headier subject matter. Although only three of the album’s songs were co-written by Chesney himself, Welcome to the Fishbowl still manages to sound highly personal and introspective. Chesney has an uncanny knack for finding top-shelf material which sounds autobiographical and mixing it with his own to craft a uniquely distinguishable musical statement.